A friend kindly lent me the 2007 BBC version of Jane Austen's Persuasion. Starring Sally Hawkins and Rupert Penry-Jones, I felt the movie stayed fairly true to the book. EXCEPT near the end. In reality, the end is the climax of the book and the movie portrayal was a bit disappointing - ok, a LOT disappointing. "Invalid" Mrs. Smith is running to catch Anne...Anne is running around Bath "like a chicken with her head cut off" (according to some other reviewers I read! lol! )...and, well...it just wasn't quite the same as the written book. I can never understand why movies do this! If they'd strayed so far with the entire movie, I would perhaps be more understanding. But, since the rest of the movie was done quite well, I don't know why they messed with the best part! When I looked at the clock, saw that the movie only had about 15-20 minutes remaining, and I knew that they hadn't yet exposed Mr. Elliot's true character or Wentworth's letter, I had a sinking feeling that I was going to be dissatisfied. I then watched the BBC's 1995 version of Persuasion. Having watched the 2007 version only days before, I, initially, disliked the casting of the characters. However, as the movie progressed, I found myself liking them a bit more. Amanda Root plays Anne Elliot flawlessly, and although Ciaran Hinds is not quite as dashing as Rupert Penry-Jones in the '07 version, he portrays Captain Wentworth quite well. Mary seems much more as I imagined her in the book and, well, I could go on and on to compare the characters of each movie. Honestly, I found most of them more likeable in the 2007 version. 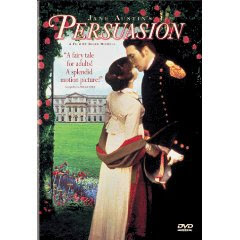 About 20 minutes longer than the latter version, 1995's Persuasion has sufficient time to unfold more details of the book. Those who were disappointed in the 2007's ending, will be much happier with the handling of the infamous letter in this version! I also preferred the final ending in the 2007 movie! Neither endings are found in the book...but this one was a bit more romantic to me. My only complaint: profanity. True, I only counted 3 outbursts, but in our home, 2 usually means: OFF! I am always disappointed when profanity is used - especially when it did not occur in the book. Never needed....! And, it certainly did not add to the movie, nor would it have taken away from it if it had not been used! Other than the unnecessary language, the 1995 version is very true to the book and I enjoyed it. Because this movie reveals a bit more of the book, you may be able to watch it independent of reading and still enjoy it. However, I know you'd understand and appreciate the portrayal much more if you attempt to read the book first!